Notorious tramp gang leader Col. Brinkley murdered engineer Erik Engel to get his half of a secret map leading to the treasure of silver lake. Engel's son Fred leaves at once to catch the murderer and meets Old Shatterhand and Winnetou who promise to help him find the tramps. 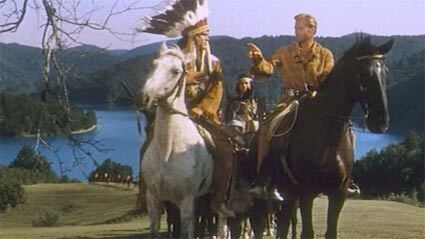 While Old Shatterhand, Fred, Trapper Sam Hawkens, and Gunstick Uncle are riding to Butler's Farm Winnetou finds the tramps' camp and overhears their future plans. He learns that they plan to attack the farm because Engel's friend Patterson who owns the second half of the map lives there. The tramps attack Butler's Farm and Old Shatterhand and his friends try to withstand as long as they can. When Patterson and his daughter Ellen return from a ride they are captured by the tramps and can be freed only by a trick. But now the Colonel has got the second half of the treasure map. Finally Winnetou arrives with his friends, the Osage indians, to rescue the farm and Fred Engel manages to get back one half of the map.